These chicken mini turnovers are a great appetizer to serve for Grey Cup game or for that matter any occasion. 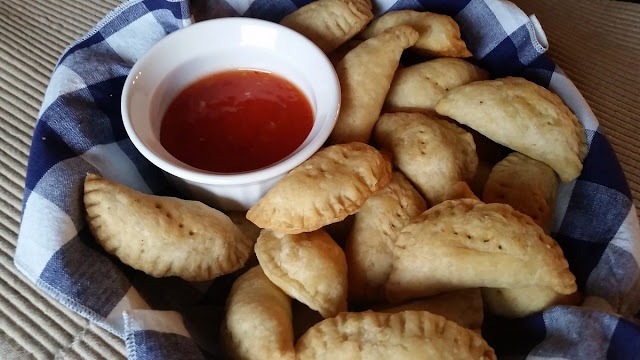 Dip these warm turnovers in a sweet chili sauce and you will go back for seconds, guaranteed. In a large skillet saute celery in butter until tender. Add chicken, broth, seasonings, and cream cheese stirring until cream cheese is melted. 4 or 5 tablespoons cold water. In a medium sized bowl whisk together flour and seasonings. Cut in butter with a pastry blender until mixture resembles coarse crumbs. Gradually add water a tablespoon at a time tossing mixture with a fork until a ball forms. On a floured surface roll pastry to 1/16 inch thickness. Cut circles with a 3" round cutter. Re-roll scraps and cut more circles until the pastry is used up. Mound a heaping teaspoon of chicken filling on half of each circle. Moisten edges with water, fold pastry over filling and press edges with a fork to seal. Prick tops with fork. Bake in a 375º oven for 20 minutes. They should be golden in color. Yield: 20. They freeze well. *Note: I had topping mixture left over, it's very tasty spread on a bun with a sprinkle of cheese and broiled in oven until bubbly and toasty. I would love to try these - they look delicious and would make a great New Year's Eve appetizer as well. Hmmm - next time I have some left over chicken I'll have to make them. I didn't make it all the way through the recipe before my mouth started watering! I have to try these! I can't wait to try these. I have growing kids and I'm thinking these would be great to make a bunch of and freeze for snacks. Just our of my 'own' curiosity - could we use store bought pie shells and cut out the smaller pie circles. I'm thinking that some out there might not be able to make a pie pastry. Sam, of course you could. That would be a shortcut indeed! Thank you for sharing.